School will start prior to Labor Day again for the 2017-2018 school year. The school board voted Thursday night to approve the 2017-2018 school year calendar with a start date of August 28, 2017 and an end date of May 31, 2018. View the calendar. The approved calendar was the favorite of about half of parents surveyed and the clear preferred calendar of teachers, who believed the earlier start better meets the needs of students. One teacher commented that "learners are ready to return to school by the middle of August - they're crisp and ready to learn, much more so than when we go into the first week of June. It also provides an additional week of curriculum exposure before spring testing." Ten candidates are vying for three open seats on the school board this November. This is a very important election and the outcome will set the direction of our school district for years to come. 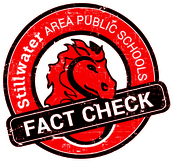 The Stillwater Gazette hosted a candidates' forum on Monday, Oct. 10. Watch the forum online. The district’s plan to build opportunities for students to learn and discover (BOLD) isn't about closing schools - it's about providing all of our kids with the support and resources they need when they need them. Check out our Making BOLD Choices infographic and read an article for more details. There have been a lot of questions asked, concerns raised, and misinformation spread since BOLD was first introduced last year. During the October 13 school board meeting district leaders revisited the topic of BOLD to share what it would mean for students, as well as review what would happen if BOLD were reversed. Watch the presentation from Superintendent Pontrelli. According to data gathered by the MN Department of Education, we spend less on administrative and district support costs than other districts in the seven county metro area. Boundaries will be changing for the 2017-2018 school year, but exactly what they will look like is somewhat uncertain for staff and families across the district. As the district awaits resolution on a Court of Appeals decision on school closures (which is expected later this winter), administrators are working on two separate plans – the one approved by the school board in March 2016 and a new contingency plan currently in development. Learn more and weigh in with your feedback. Homecoming 2016 was a huge success - bringing together Pony students past, present and future. Check out our Facebook page for photos of all the fun! Student journalists from the high school's Pony Express newspaper, Kabekonian Yearbook and Stylus arts magazine earned top awards in a state contest. Read more. The boys and girls soccer teams are both ranked top in the state. They will play for the Section Championship on Tuesday at home. Watch our Facebook page for updates. A growing number of children and families in our area struggle to make ends meet. We're working to make it easier to help our families access support through community organizations. We encourage families to access our digital Backpack to learn more about free/reduced cost food, scholarship programs, and even medical care. The school board will hold a retreat on October 18, 2016 from 7:30 -11:30 a.m. to work on their cultural competency goal. The retreat will take place at Oak Glen, 1599 McKusick Road, Stillwater. See official notice.